On Monday August 3, 2015, Jim returned to St. Mary’s Hospital in Madison for revision of hip replacement surgery performed seven weeks prior. At his follow-up visit the previous Wednesday his surgeon saw something out of place in the x-ray and commanded him back into surgery ASAP. So on that Monday morning bright and early, I drove Jim to the hospital again, left him in a pre-op room with a cadre of scrubs-wearing professionals again, and returned to the now-familiar Day Surgery Waiting Room again. After a few moments I remembered I had better options—the cafeteria, the beautiful garden—and took my leave. Before long I was ensconced in the garden with coffee and my laptop, feeling productive to a fault. After a bit I remembered the chapel that I had checked out on my previous visit. There was a service starting at 11:30. Why not attend? If the surgery hadn’t “taken” the first time, maybe this was something I was supposed to do, part of my role as the supportive caretaker. I can’t remember the last time I attended a church service. I was raised in the Episcopal faith, and it was very important to my family growing up, but it is not a part of my life today. But this is a Catholic hospital, after all. Why not, while in Rome, do as the Romans? 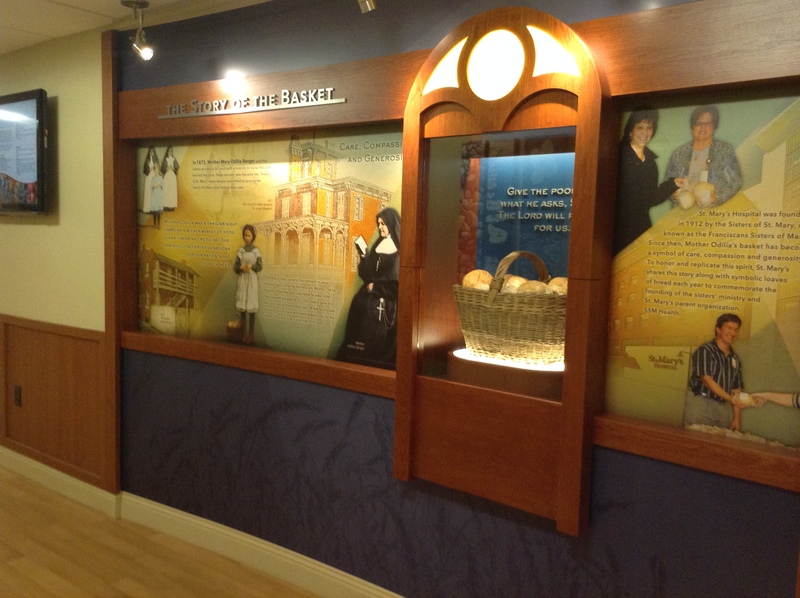 Plus, I’m so in love with the St. Mary’s hospital experience that I wanted the full immersion. And so I packed up my laptop and headed for the service. I was the first person to sit down in that bland circular concrete nondenominational chapel. A half dozen more people trickled in. The chaplain came along. An assistant prepared the altar, a round focal point at the center of a round womb of a space. The chaplain began the service with a reading from the Old Testament, Exodus 16:31. We heard how the Israelites found manna in the desert to sustain them. The second reading was the Gospel according to Luke, 9:16, about Jesus feeding the multitude with a few loaves and fishes. And I thought, how interesting; this is about bread, and my husband in the operating theater right now is a baker. Next, the congregants were offered a few moments to speak their prayers; for safe travel, for a cure, for release from pain. Then we got to the part where the congregation is offered communion. I debated whether I should take part, being such an unfaithful non-Catholic anyway, but I did want the full experience. I filed up along with the other worshippers to stand before the round altar. The chaplain pressed a wafer into my hand. Putting it to my mouth, I felt its fish-food-like texture, tasted its staleness, still familiar after all these years. And then I waited for the chalice of wine—but it didn’t come! The assistant had blended wine and water in the chalice, but it wasn’t offered to us, nor did I see the chaplain put it to his lips. I felt strangely unfinished, the deed of communion with the Holy Spirit incomplete. We passed the Peace and the service concluded. On my way out of the chapel I thought of stopping the chaplain for an explanation, but he was busy with others more faithful than I, and I let it go. * I headed for lunch in the cafeteria. And as I went, I thought—how interesting; bread again, and my husband the baker a few rooms away, under the surgeon’s knife. On the way to the cafeteria I noticed something I hadn’t seen on my previous visits to St. Mary’s: a display about bread. Mother Mary Odilia Berger and five nuns came to St. Louis with a mission to nurse the sick and aid the poor. These women, who became the “Sisters of St. Mary,” were deeply committed to serving the needs of others before their own. Sister Odilia was a familiar sight, carrying a wicker basket of food, clean linens, and medicine. She gratefully accepted donations for her patients and those in need. One day, man came to the convent asking for food. “We only have enough bread for us,” said the sisters. Upon hearing the request, Mother Odilia said, “Give him what he asks. The Lord will provide for us.” The Sisters gave him their bread. A few of hours later, a little girl came to the door with a basket full of rolls she had made for the nuns. St. Mary’s Hospital [in Madison] was founded in 1912 by the Sisters of St. Mary. Mother Odilia’s basket has become a symbol of care, compassion and generosity. And there in the display, between the photos of the nuns and this story printed in large type, was a glass case containing Sister Mary’s wicker basket, full of rolls of bread. They were probably plastic, but still. And I thought, what is it about the bread today, and my husband, who once baked every day, until pain brought him to a stop. And so it came to pass, that three times in the space of an hour, as I sat waiting for my Jim to come through his surgery, bread appeared, just as it had for the Israelites and Jesus’ multitudes, just as it had for the congregants in fish-food form, just as it had for the poor man and the nuns. As I write this, Jim is recovering much more quickly from this surgery. This week, he baked bread again. I’m savoring every bite. And thinking that maybe care, compassion, and generosity have something to do with what bread is trying to tell me. This entry was posted in Sarah's memoir and tagged St. Mary's. Bookmark the permalink.